« Roberts Smashes His Way Into The Top 40! Nick Wale turned “Reprisal: The Eagle Rises” into a hit overnight. Ever hear the song “Hungry Like The Wolf”? Well, this guy is hungry for the hits. It becomes a struggle when you have written a book—a good book, no less! What do you do? You can hire some PR guy or girl who takes thousands off you and does nothing. You can pretend you wrote the book for your family. You can say that “there’s no money to be made in writing.” You can be the art writer with a chip on your shoulder. 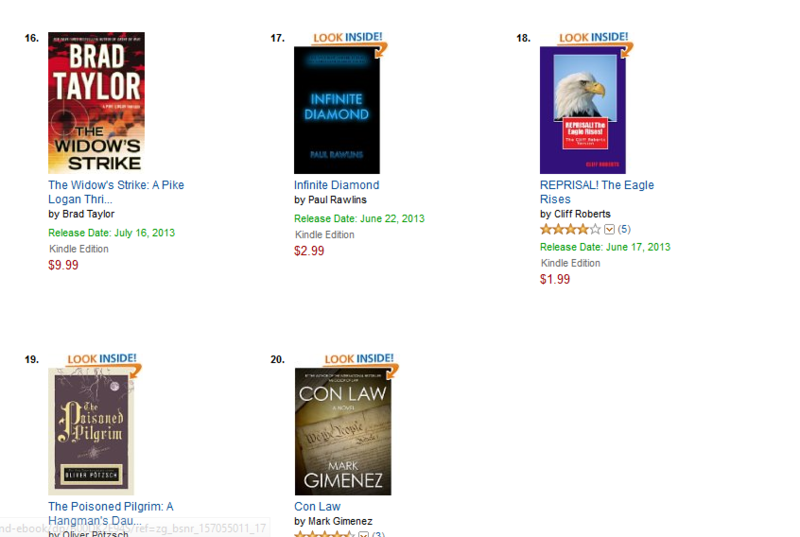 You should meet the “Hitmaker.” He has just sailed into the top twenty on Amazon, again, with “Reprisal! The Eagle Rises.” The writer is Cliff Roberts, and the PR is Nick Wale. I caught him for an interview! What sells? Let’s get some free advice from a guy near the top of the pile. Q) Hi, Nick, how are you taking to being the “Hitmaker”? A) Hola! Who the hell came up with that? I thought that was an album by Burt Bacharach. I like it though. The “Hitmaker” is doing just fine… Just getting by, I guess. Q) Modest? You are currently in the top twenty again? Is that just getting by? A) No, Cliff Roberts is in the top twenty. Nick Wale, Hitmaker, or whatever you call him is still the dude who promotes books. A) I don’t really take it. It just is. I don’t let that stuff get out of proportion. If people believed half the hype in the world, we would all be driving Gremlins. Q) So, what is a hit book? A) A hit book sells. It sells because it has something about it. It doesn’t have to be perfectly edited, it doesn’t have to be THAT commercial. It just has to have that IT factor. It catches on. The trick for a PR is to identify WHAT will make it sell, and then exploit that. For Roberts, it’s the fact that he writes excellent stories. For Chris Keys, it was an eye for detail. Terry Irving has a unique way of writing. It’s different for everybody. All books aren’t born equal. A good PR realises that each book will have weaknesses, and people will pick on that. You just have to work hard to make sure the good stuff gets to the majority of people. Q) What do you do that other PR services don’t do? A) Nothing. I just do it with class, and I don’t make people take out mortgages to hire me. I don’t tell them that they will sell a million copies, either. I do what I can, and when the magic elves help me—it clicks! Don’t believe the hype when a PR agency tells you that if you spend ten thousand dollars you will have a hit. You probably won’t. A hit shouldn’t cost any more than time, patience, hard work and working with a professional who will charge you professional prices. The problem with the majority of PR services is simple—they don’t get hired that much—so the person who DOES hire them has to pay them a lot of money to make up for it. Q) How often are you hired? A) All the time! Results, a good eye for clients, a good list of authors, strong candidates for hit novels keep me in that magic thing called work. A good reputation helps. I think the biggest factor is that I just bring in the results—be it sales, strong interviews, opportunities, chart placings—whatever. I just bring them in. Q) What should people look for in a PR? A) Someone new, someone who doesn’t give you a spiel about how rich and successful they are. I was told by a great friend of mine, Jacob Singer, who is a top stock market analyst, “If you are told by someone that they have the tips to make you a million dollars—ask yourself—why aren’t they using them themselves?” That has always stuck with me. If someone is telling you how successful they are, question it. Look for evidence. I always try to tell my clients that anyone promising a number one tomorrow is lying through their teeth. Number ones take time. Q) You are a conservative guy by nature, aren’t you? Q) Did you get coached in the art of business? A) No, not really. I just copied off successful people I know. I tried to see what worked for them. I worked for a writer called Mike Trahan, he was another guy who never rushed into anything. You had to explain things through and through. No funny business. Guess what? I took that to heart, and now I ask more questions than my clients. You can’t leave anything to chance. Q) So, I guess you made mistakes, too? A) Sure! I have passed up some great manuscripts. I have lost business through making mistakes. I have screwed up interviews. The important thing is that I got back up and tried again and again. I learnt from my mistakes, and that is what’s important. If something doesn’t work with your promotion—give it another shot! Try something else! Do anything, but don’t sit on your fanny wondering where it all went! Q) How should people begin their promotional efforts? A) Look at a budget. Look at what you can afford, and then look at what will sell your book best. Will it be a Facebook ad that will get you a new audience? Will you spend advertising money on your Facebook page? Will you buy an auto-tweeting client? Will you hire a PR? What will your budget allow you to do? Then look at where the market is… Are thrillers selling? Are memoirs? What is number one on Amazon? What does your book has that makes it stand out? Who are you? Do you havepersonality? What are your past experiences? Were you in the Service? You need to look at every angle. I will explain why. The reason you need to look at every angle is simple. You need to know what groups you can join, military writers groups—for example. If you join one of these groups to promote your book—you will be more likely to be accepted if you have a military-themed book or background. You need to look at who you are and what you have to offer. Q) What would you do with Joe Bloggs aged twenty-six with no job, a loan to pay for your services and a book about skateboarding? A) I would get Joe on the youth groups, skateboarding groups. I would have him on webinars talking about skateboarding. He would be promoting his book the old fashioned way—with personality to an audience that wants to hear about his work. Not just spammed links all over the Internet. Joe would also be running a sample book; he would have professional interviews and double interviews with relevant people. Joe would be busy—too busy to remember that he has no job. Q) Do you really think “spamming” is a bad idea? A) Yes. It’s a bad idea all around because it ruins your reputation. You only get one reputation—bestselling writer or spammer? Your choice. Q) How can you account for the success of “Reprisal! The Eagle Rises”? A) I can’t. The readers can. Cliff Roberts and I have no idea why it took—we just did the right things. We promoted it the old fashioned wayand now it’s roaming around the top echelon of Amazon. Why did it hit? Where to flies go in winter? What happened to perms? Nobody knows, and frankly, nobody cares. You just have to do the right things to make the hits happen. Seriously, analyse yourself, your book and look where it will sell. Get yourself professional interviews, professional representation and exploit your books strengths. That’s how the magic happens. It worked for Lloyd Tackitt. I helped move 2900 of his books in one month. It happened for J.W. Northrup when his short stories went wild with sales. 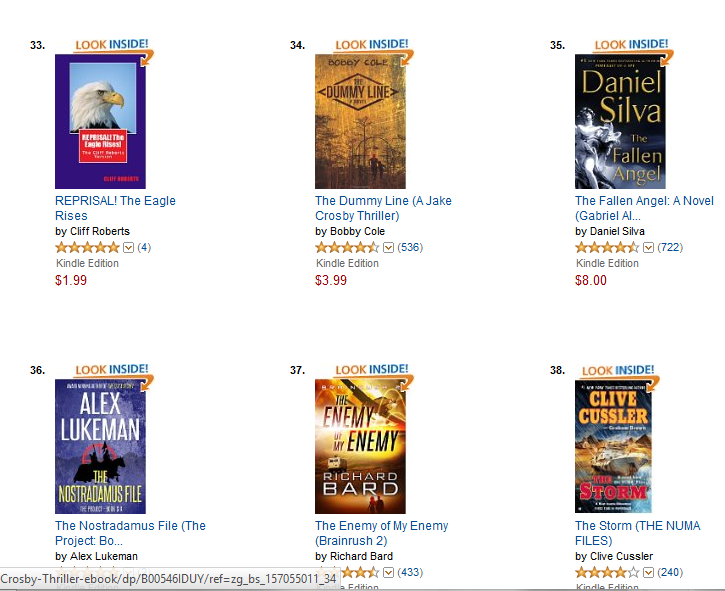 It happened for Cliff Roberts when he broke the top twenty on Amazon. It happened for Carol Bond. It can happen for you. Q) Last question—where can people contact you? A) Get to me via email at Nicholas.Wale (@) hotmail.co.uk or you can write to me at Nick (@) nickwale.org. You can also find me at my website www.nickwale.org . It will be a lot of fun meeting you! Tags: Alex Laybourne, Book Promoter, Book Promotion, Book Sales, How can I make my book sell, I want my book to sell, low book sales, Nick Wale, Novel Ideas, Brand cialis, Female viagra, Why Isn't My Book Selling? Very nice interview, Nick. Thank you for the mention and kind words. Blessings, Tom. How To Sell Books: An Interview With PR Nick Wale | Novel Ideas | Hey Sweetheart, Get Me Rewrite!